This spa sled mover will fit through standard doorways! Do you need to move something big and heavy? 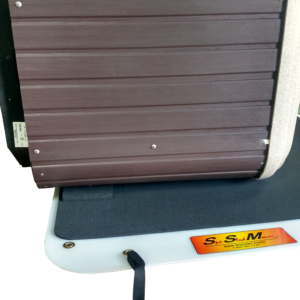 The spa sled mover helps you easily move a spa, hot tub, refrigerator, furniture, big screen TV, wood stove, pellet stove, generator and other big, heavy stuff. The spa mover can be rolled into a small compact bundle and easily stored. It is small enough for one person to carry. 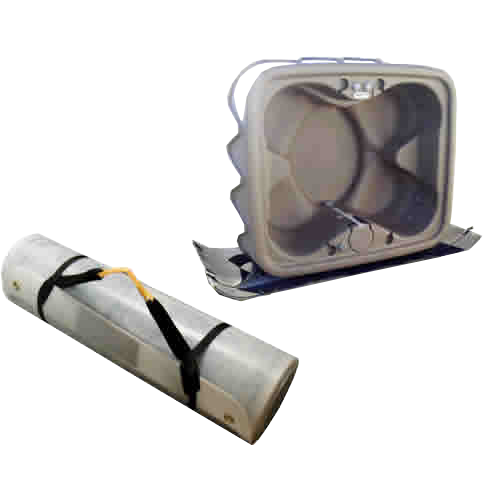 The mover can be stored in a car trunk or on a shelf in a service truck. When fully unrolled the mover measures 106 inches (8 feet 10 inches) long and 35 (2 feet 11 inches) wide. You can use the mover to pull a spa weighing up to 1000 pounds. The Spa Sled Mover comes with four (4) straps attached. Straps are each 53 inches long overall length and have a 2 inch wide double thick wrist strap. The Spa Sled Mover (Patent No . : US10,059,361 B2) comes with four (4) straps attached. Straps are each 53 inches long overall length and have a 2 inch wide double thick wrist strap. Or, watch our Spa Mover video on YouTube.